Paiute myth told that hoodoos were the petrified remains of an earlier people, who long ago inhabited this land. Coyote turned them to stone in repayment for their evil ways. Just north of Highway 89 and east of the Cockscomb, a variety of landforms have eroded from one of the Grand Staircase’s giant steps. 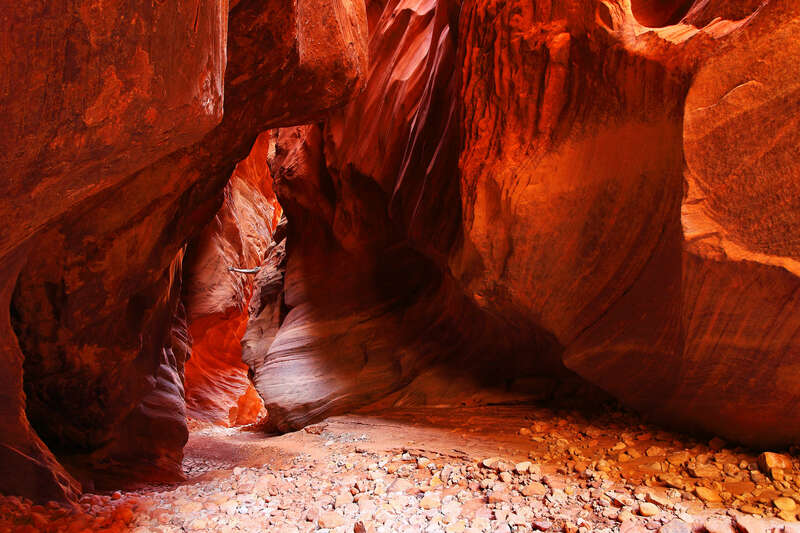 The Paria Rimrocks contain cliffs, buttes, hoodoos, and badlands: all carved from sugar-white and cinnamon-red sandstone. The Rimrocks look like a geological confectionery. Not long ago, this area was virtually unknown. When such fantastic scenery is easily accessible, it isn’t bound to stay a secret for long. 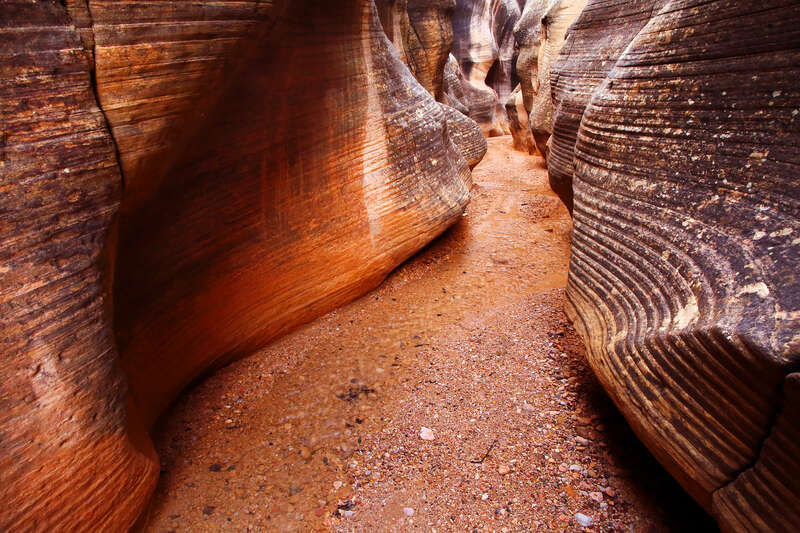 Photos, word-of-mouth, and an improved trailhead have all helped make this one of the most popular pit-stops on the road between Page and Kanab. The most-visited formation within the Paria Rimrocks is Toadstool Hoodoo: a wide, brown chunk of stone balanced upon a preposterously thin red pillar. It’s appropriately named. Toadstool Hoodoo watches over the badlands below. Its brown Dakota capstone has spent millions of years sheltering the underlying column of softer, red sandstone. Who knows how much longer it will stand? Hoodoos are formed by differential weathering. Usually this happens once a hard capstone settles on a softer layer of rock. The softer rock is gradually worn away around the capstone, but the rock beneath the capstone is protected. This leaves the characteristic mushroom-shaped columns, each with a personality of its own. Dramatic examples of this process can be found all across southern Utah. While most hikers stop at Toadstool Hoodoo, there’s much more to see here. Take some time to explore the area—you won’t regret it. From the trailhead, a well-worn path follows a sandy wash northward. After about half of a mile, the trail climbs through some badlands, and right to the base of Toadstool Hoodoo. The hoodoo sits on the edge of a broad, red terrace. The trail continues up to the top of this terrace, where more hoodoos stand huddled in a small cluster. They are easily seen from anywhere atop the bench. Tall white-grey cliffs rise to the north. The bench stretches away to the west. The land below the bench slopes up into a scenic mess of red and white badlands, then falls away abruptly into an adjacent valley. To the east, the bench is bordered by a low ridge. The far side of this ridge forms one wall of a white-rock canyon that winds northeast for a mile before narrowing. In the distance, the surrounding consists of washes, mud hills, and eroded, multicolored buttes. The rimrocks stretch for about two miles westward. From Kanab, follow highway 89 eastward for 45 miles. Shortly after passing the BLM Paria Contact Station, the trailhead is visible to the north. A short access road leads to a small parking lot. A trailhead register is located by a hiker’s gate in the fence line. From the hiker’s gate follow the trail north. From the trailhead, the hike to Toadstool Hoodoo is about 1.5 miles round trip. 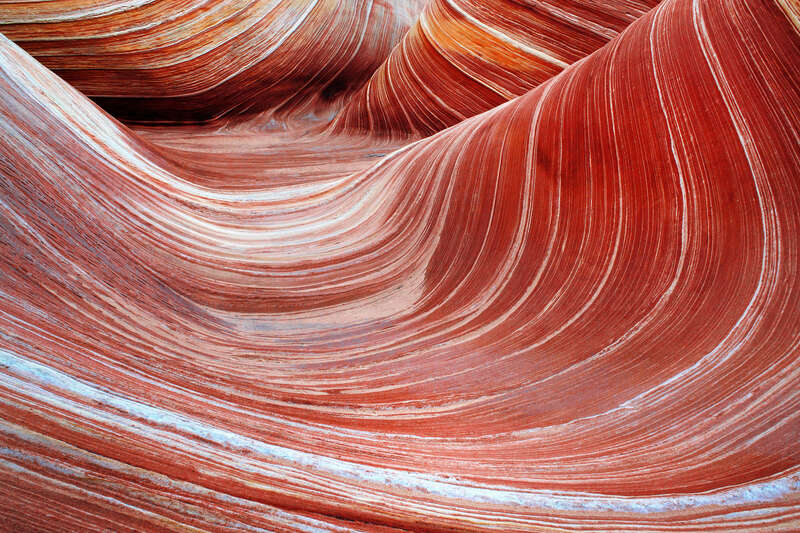 Wind and water have carved bizarre, multi-hued sculptures from the sandstone of the Grand Staircase.